After gorging on a feast of sausages, blood pudding, young sow’s udder, sea bream, lobster, mullet, Attic honey, and Syrian dates, all washed down with a few glasses Falernian wine, it is little wonder that a Roman diner might begin to feel quite full. It was once thought that a diner could, at this point in the meal, make a quick visit to the vomitorium – a room adjacent to the dining room replete with a basin and feathers to tickle the throat – in order to make room for the next course. There is a delightful array of Latin words associated with the act of throwing up, from the verbs vomo (“I vomit”) and vomito (“I keep on vomiting”) to the nouns vomitor (“one who vomits”) and vomitus and vomitio, both of which can either refer to the actual business of chundering or the yucky stuff itself. The vomitorium is clearly part of this group, but no ancient source actually employs the word to describe a place for post-prandial puking. It first appears in the Saturnalia of Macrobius, written in the 5th century AD. Macrobius uses the plural vomitoria to refer to the passages through which spectators could “spew forth” into their seats at public entertainment venues. Vomitorium/vomitoria are still used today by archaeologists as architectural terms. This misconception of the vomitorium as a vomiting room is widely acknowledged in popular culture. Our aim is to explore how the myth arose and why it has proved to be so persistent. This passage is commonly cited as the first time vomitorium was misused to mean a room used for vomiting. However, there are references in newspapers and journals that pre-date Huxley, going back to the 19th century. They reflect the confusion about whether the vomitorium was a passageway or a room for emptying one’s stomach. 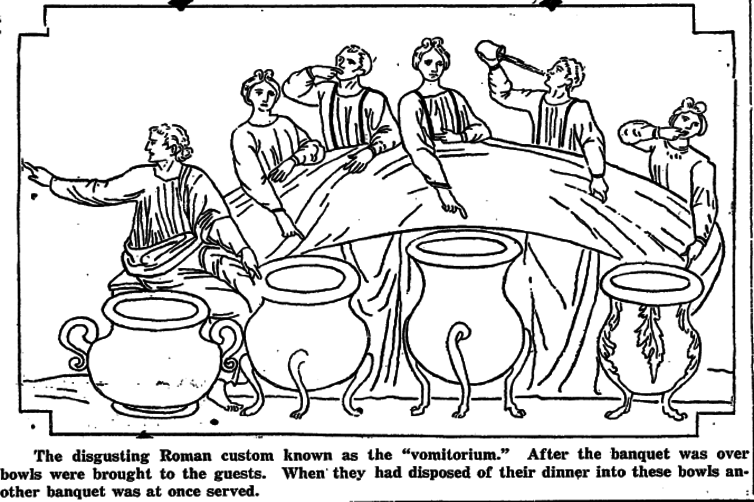 In an 1871 account of Christmas in England, French journalist and politician Felix Pyat described the holiday meal as “a gross, pagan, monstrous orgie – a Roman feast, in which the vomitorium is not wanting.” By 1871, then, the vomitorium was already misunderstood as a chunder chamber. In the very same year English writer Augustus Hare published his Walks in Rome, in which he assumed that the chamber adjacent to the dining room in the Flavian Palace on the Palatine was none other than a vomitorium, which he described as “a disgusting memorial of Roman life”. In these rooms, Hare imagined, Nero poisoned his step-brother Britannicus, the concubine Marcia drugged Commodus, and Pertinax received rumours of revolt. We can almost see the knowing smile of the anonymous critic in an 1888 edition of Saturday Review when he described Hare’s account of the vomitorium as a “delightful blunder”. Roman archaeology, our critic warned, is after all too technical a subject to be dealt with by an amateur. An illustration in a 1916 edition of The Washington Post got the myth slightly wrong, showing bowls at the meal rather than a separate room. 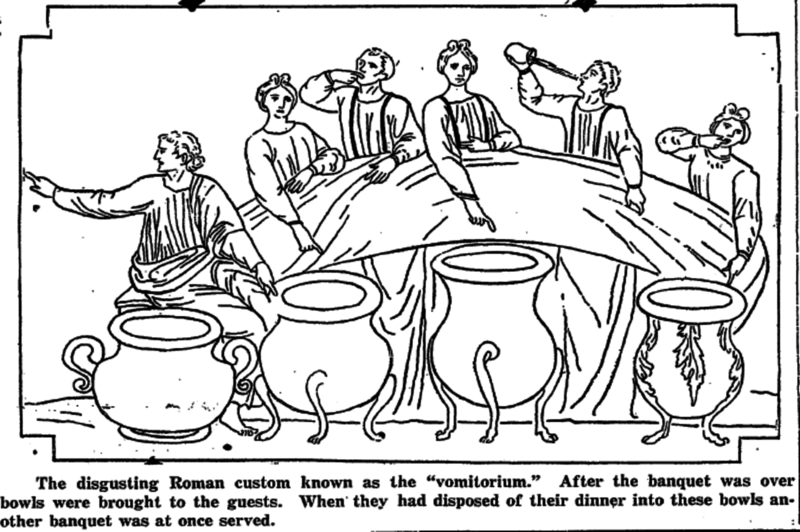 Not to be left out, the Los Angeles Times ran two articles (in 1927 and 1928) mentioning Roman feasting and the vomitorium, one of which was a precursor to the notable historian Will Durant’s work The Story of Civilization. Here, “graduate Epicureans” avail themselves of the vomitorium to “free themselves for more”. By the time Huxley’s novel was published in 1929, therefore, a visit to the vomitorium was entrenched in the popular imagination as an essential part of any Roman dinner party. Where did the idea of the vomitorium come from? Huxley’s novel alludes to the stories of outrageous gluttony in the pages of Roman courtier Petronius’ Satyricon (written in the 1st century AD). As it happens, Petronius’ novel doesn’t feature the vomiting room, merely an unfortunate description of one character’s laboured bowel movements over dinner. For stories of dinner-time barfing, we have to look elsewhere, to scandalous stories of imperial excess contained in Suetonius’ On the Lives of the Caesars and Cassius Dio’s Roman History. According to Suetonius, who was secretary of correspondence to the emperor Hadrian, the emperor Claudius always finished his meals excessively bloated with food and wine. He would then lie down so that a feather could be inserted down his throat to make him disgorge the contents of his stomach. Claudius’ excesses paled in comparison to the emperor Vitellius, who allegedly feasted four times a day, and procured exotic foods from all over the empire to satiate his enormous appetite, including brains of pheasants and flamingo tongues. He is said to have vomited between meals in order to make room for the next banquet. The historian Cassius Dio memorably remarked that Vitellius was “nourished by the mere passage of the food”. Suetonius and Cassius Dio included such stories not only to entertain their readers, but also to make a point about the fitness of individuals to rule the Roman empire. Greed and gluttony represented devotion to pleasure and the inability to maintain control over one’s desires. Claudius and Vitellius are both said to have abandoned official duties for the sake of their next feast. Suetonius claims that Claudius once left the courtroom when he caught a whiff of food cooking in the temple next door and went to join in the banquet. 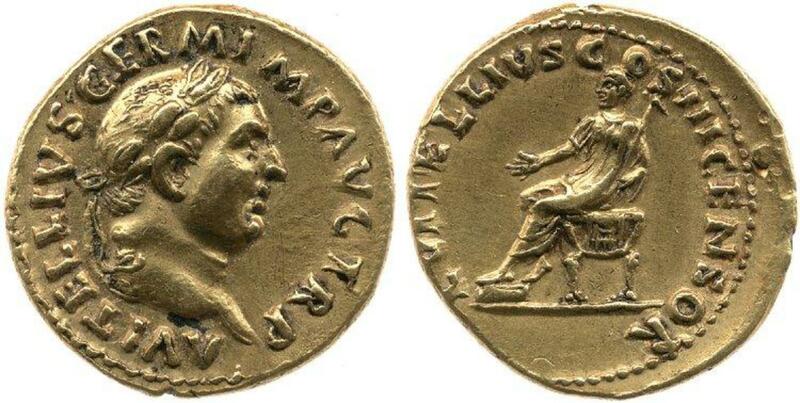 When presiding over sacrificial rituals, Vitellius is said to have gobbled up the sacrificial meat and cakes himself. Both these examples constitute gluttonous derelictions of duties. Vomiting was the ultimate sign of profligacy and wastefulness for an emperor, who was literally chucking up the wealth of his empire. Romans would have understood the moral messages contained in these anecdotes. A proper Roman man was supposed to be devoted to the gods, his family, and to the state – not to his belly. Excessive consumption of food was a sign of inner moral laxity. They vomit so that they can eat, and they eat so that they can vomit. They don’t even consider the dishes which they have assembled from across the earth worthy of digestion. This statement, as with the stories of Vitellius and Claudius, does not reflect reality for most Romans, least of all suggest that actual rooms were reserved for such decadent practices. It is a moral criticism. Vomiting was actually more commonplace in the Roman world as a medical treatment. Celsus advised that vomiting should not become a daily practice (for that was a sign of luxury) but that it was acceptable to purge the stomach for health reasons. The adjective vomitorius/a/um was employed to describe emetics into the Victorian period. Most residents of the city of Rome could not be so cavalier about wasting their calories. Their subsistence diets consisted mainly of cereals, legumes, olive oil, and wine, which had to sustain them through their lives of manual labour. The food that Vitellius gobbled up at sacrifices to satiate his enormous appetite would have been gratefully savoured by the people of Rome. Such foodstuffs were carefully controlled. Even at religious festivals, the best sacrificial meat was reserved for aristocratic participants or sold off, not distributed to the common people. 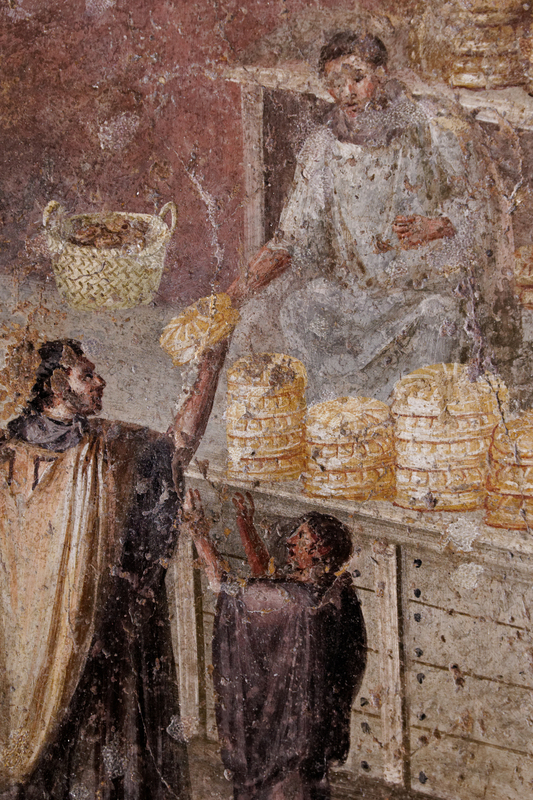 The famous “grain dole” provided to Romans was in fact a privilege confined to a mere 150,000 eligible citizens out of the million plus residents of the city of Rome. Food was a privilege. Of course, Macrobius’ own use of the term vomitoria was connected to vomiting, conjuring up the image of the amphitheatre spewing out people. The association between an architectural term and lurid stories of vomiting Romans found in ancient texts easily led to the misinterpretation of the vomitorium as a room for throwing up in the 19th-century imagination. Those who dined to excess were regarded as similar to Romans, a people popularly known for their luxury and decadence. The myth of the vomitorium has therefore been shaped by our fascination with the antics of dissolute emperors and elites who loved a Technicolor yawn between meals. Since antiquity, we have derived pleasure from hearing about and criticising the overindulgent dining habits of others as a sign of their moral laxity. (Mis)interpreting a suggestive word like vomitorium as a room intrinsically tied to such decadence was a mistake waiting to happen.